. :: ARMCO - Exclusive Agent Of ISHEBECK TITAN ::. The impression of a mighty tree has inspired us. It has a network of large and small roots, which support and anchor it into the soil without the need for a concrete foundation. The roots transfer external, vertical and horizontal static and dynamic forces, moments and shocks which the tree has to absorb. This network of roots enable the tree to withstand wind, snow loads and earthquakes. On the one hand the roots interlock with the soil, on the other they convert the soil to a monolithic structure (root ball). As the tree grows, the roots grow with it to ensure that it has a firm anchorage sufficient for its size. How the tree calculates the size and complexity of the roots needed to provide stability is unknown. What is known is that a composite material is being created to protect the tree and assure its longevity. We have learned from the tree; to take the soil into consideration for construction, to use resources economically, to improve and reinforce the soil. A unique feature is the drill steel use as the tension-and/or compression member. 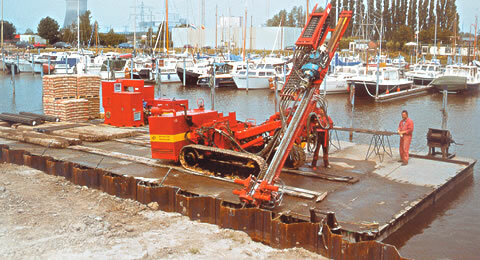 This technique eliminates two labor intensive elements namely required for anchor installations They are: the insertion of the anchor itself and the removal of the drill rod and the casing.Consenquently smaller drill rings can be used, the amount of grout is reduced and substantial labor savings are achieved. This guarantees a positive complete filling of the annulus as well as all fissures and cracks.This method is much easier than using additional tubes for grouting, air vents and post-grouting. high notch toughness > 39 J in comparison to high tensile rods or strands having > 15 J or glass fibre anchors. This steel is not affected by hydrogen embrittlement or by post rolling heat treatment. In addition, it offers high shear resistance. This material (no. 14462) is equivalent to "double corrosion" DIN 50929 part 3 - likeliness of corrosion in construction parts and underwater construction. Working with this TITAN-INOX material is much easier than with the standard permanent anchors which are surrounded by grout in corrugated plastic tube, especially as far as extension (coupling) and the preparation for the anchor head are concerned. Cutting, extending, pre-stressing and load releasing on the anchor are possible. A thread pitch of 6° eliminates the need for counter nuts at each coupling. 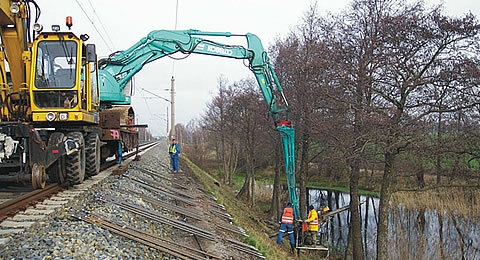 which it has been used, often providing a more economic, efficient and effective alternative to traditional construction and engineering methods. 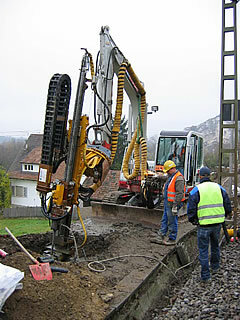 Ischebeck Titan micropiles comply with DIN EN 14199 micropiles. body transfers tension and/or compression forces into the ground. Ischebeck TITAN Anchor Piles can be used wherever a traditional ground anchor is being considered and provide a rapid, efficient method of installing tie back anchors in one visit to the hole. All Ischebeck TITAN bars use the same installation technique and, with a range of 100kN to 3000kN, only the drilling rigs get bigger. Grout injection technique continually scours and flushes the sides of the drill hole, enhancing mechanical connection to the soil. Ischebeck TITAN bars are made from a high quality, high yield, low carbon steel, which does not suffer from hydrogen embrittlement or stress corrosion cracking. The grout body provides simple, permanent corrosion protection. Very low creep characteristics of the bar obviate the need for re-stressing. reinforcement, which allows a controlled improvement of the natural stability of the soil. TITAN soil nails provide friction, shear and tension strength in loose materials, combining all into a new monolithic structure. Existing soils or weathered rock. TITAN rotary grouted, self drilling soil nails. Surface treatment with reinforced shotcrete, geotextile mesh or tensioned wire nets on slopes to 70 degrees. Installation is practically free from vibration. 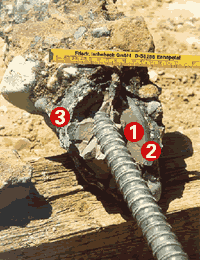 Drill rigs can install soil nails at all angles. As there is no requirement to case line the drill hole, most drill rigs installing TITAN soil nails are smaller and can cope well with slopes and confined spaces. Soil nailing offers the opportunity to produce an environmentally friendly but technically safe "green wall" solution, often less expensive than traditional back anchored retaining walls. 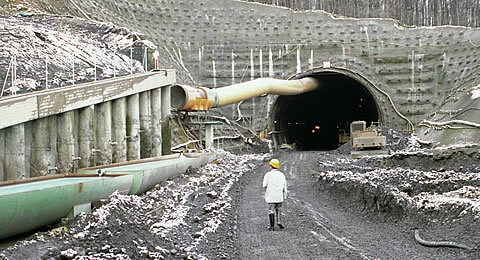 Rock bolts are commonly used throughout the civil engineering and tunnelling industries (especially NATM). They are used to improve the stability and load bearing characteristics of a rock mass. In the tunneling industry, Ischebeck TITAN rock bolts are used for horizontal fore-poling, slope stabilisation at the tunnel portal and for anchoring large section tunnels with high side walls.